As it happens Sainz and Kankkunen (who finished second) took only five wins between them, a fact which nicely illustrates the dominance of Auriol and the Delta in 1992. 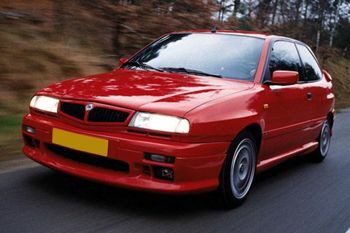 1993 saw considerably less success, despite the proven talents of Sainz in the lead car, but by then the Integrale was showing its age against full factory efforts from Toyota, Ford and Subaru and marked Lancia’s final tilt at the crown, and for that matter its last official participation in world motorsport up to this point. But, Lancia were able to make the most out of their glory while it lasted. If the road-going Evoluzione's muscle-building, Weetabix-packed looks were not enough, there were a handful of Special Editions, including the exclusive Club Italia of which only 15 were built. The snazzy graphics and flashy colours only made the 'Grale seem more impressive - it had become a cult object and a symbol of Italy. Clients included Mauro Forghieri, Luca de Montezemolo, Michele Alboreto and Dante Giacosa. If the 'standard' Evoluzione wasn't sufficiently exclusive, there was always the Lancia Hyena Zagato, a car which perhaps epitomised the ultimate Integrale. Designed in 1990 by Marco Pedracini, and launched as a full-scale model at the Brussels Motor Show in January 1992, the project was conceived following a meeting between Andrea Zagato and Paul Koot, the Lancia importer for The Netherlands. It had been almost two decades since Zagato and Lancia had last created a car, so the Hyena was a particularly emotional project. Zagato successfully created a masterpiece in modern design with traditional features such as a double-bubble roof and minimal overhangs. It was a complete rethink of the boxy Delta. After some sympathy from Lancia, Zagato struck a deal to produce 500 units. Production started at Via Arese in 1993, but the project was unfortunately stopped short due to management changes at Fiat Auto (what’s new…) and only 24 examples were made. Whilst on track with special editions, there was also the one-off Integrale 16V HF cabriolet painted silver for the bon viveur, Giovanni Agnelli. Due to the handicap of the "Avvocato", this particular Delta was equipped with an automatic Valeo electronic clutch. This car perhaps represents the most desirable road-going Delta of all time. In the final analysis, it is apparent that the 'Grale wasn’t just a brilliant rally car, it was also a sensational road rocket and one of the finest-driving cars of its era. At the time of the HF 4WD’s launch, there were other permanent four-wheel drive cars available, but none which had a setup as advanced or effective as the Delta’s four-wheel drive system. Ultra exclusive! Above: the last-of-the-line "Dealer's Collection" special edition, of which only 180 examples were made. Middle: the one-off Integrale Cabrio for Giovanni Agnelli boasted an automatic Valeo clutch. Below: based on the Integrale Evoluzione, the Lancia Hyena Zagato gave an indication as to what could be done with the underpinnings of the rally legend. Above: the Delta range of 1995-1999 was never as popular due to a poor marketing strategy. Unfortunately the Integrale never made a comeback. Below: Come on Lancia! Build the damn thing!! 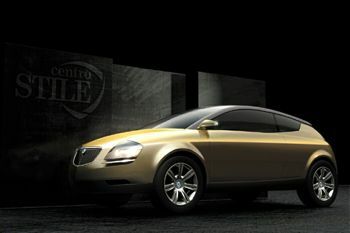 The Stilnovo represents Lancia's potential successor to the Delta, and would be an ideal player in the C-segment. Truly, the four-wheel drive Delta, in all its forms, was an antidote to the sterility which largely marked out new car releases in the eighties, and was a more than worthy successor in Lancia’s line of ‘rally cars for the road’, following as it followed in the footsteps of the Fulvia 1.6 HF, Stratos, the beautifully elegant 037, and brutal Delta S4. As a measure of the respect afforded to this car, there was an owner’s party at the factory to commemorate the last of the line in November 1994, almost exactly a decade ago this month. In fact, there is a small post-script to the Delta story. Whilst Integrale production had carried on in a small corner of Maggiora’s Chivasso plant (actually the old Lancia factory), Lancia themselves had replaced the standard Delta range with a brand-new Delta in mid-1993. Despite the name, there was almost no carry-over from the old car – apart from being based on the platform of the Lancia Dedra, necessitating all-new suspension and drivetrain layouts, the body, although recognisably carrying styling cues from the original, had no parts in common. Designed by IDEA and originally launched in five-door form, a three-door version, designated ‘HPE’ (an old Lancia name dating back to the days of the Beta), was unveiled in 1995. This car was actually conceived with more the look of a coupe, and elements of that look did indeed make it into production. Sales for the Delta II were, however, disappointing, and when it was finally killed off in late 1999, it was not replaced owing to a projected lack of demand. Even though the Delta’s sales were miniscule by the end – a piffling 9,000 were sold in 1998 – the problem seems to have been not the car itself, which was a competitive proposition when stacked up against rivals, but a dearth of effective marketing. The death of the Delta also marked the demise of the last overtly sporting Lancia, the Delta HF HPE, which also marked the last home of the classic Aurelio Lampredi-designed twin-cam (in turbocharged 193 bhp form). It has now been five years since the last Delta was made, five years which have seen Lancia’s sales suffer a steep drop and only recently get back on a steady footing. One can’t help but feel that now is an appropriate time to start thinking about a Delta III. Such a car, perhaps drawing on design cues from the 2003 Granturismo Stilnovo concept, in returning Lancia to Europe’s biggest segment, the C-sector, would help to re-establish Lancia as a genuinely significant player once again. Lancia’s key brand characteristics of sophistication, style and sportiness precisely match the demands of buyers in this sector, and provided it is executed well, there seems to be no reason why it should not be as successful as the original which kicked off the whole prestige hatch phenomenon in the first place.